Welcome to my blog. 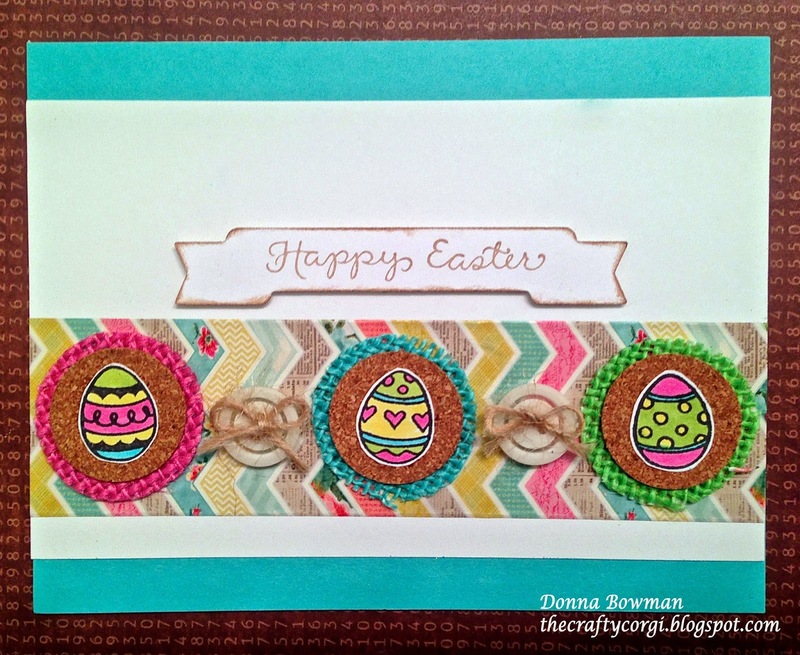 Today, I'm participating in the Denami Buttons and Bows Blog Hop. I'm so excited to participate again this month. I love Denami Stamps and I thought these Easter Egg Stamps were just too cute. For this card I used paper tape, colored burlap and cork from DCWV. I colored the eggs with Copic markers and use jute twine and buttons from PTI. The banner die is also from PTI and I used Brown Archival ink. Be sure to check out the rest of the participants on the hop and leave comments because 2 lucky commenters will receive a $20 gift certificate to the Denami Store. You have until 11:59 PM EST on Monday, April 14 to leave your comments and be eligible to win. Donna, I love your twine buttons! Fabulous card design! Cute card - love the little Easter eggs, the burlap, the cork, ant the buttons and twine. Adorable card love the eggs and buttons a very Spring time card and the burlap is a nice touch! Love the bright and cheerful Easter card! What a fun mix of textures and colors! Cute buttons with tied bows! Cute colorful Easter card, so happy you could hop with us! very festive--I like the colors and textures. Love the Easter egg card, so cute! Your easter egg card is fabulous! Cute Easter card! I love the added texture of the cork and burlap!! Such a cool Easter card Donna! I really like that colored burlap. Oh, how sweet, Donna! That burlap looks awesome as backgrounds for your pretty Easter eggs! Wow! I really like those colors! The DP is perfect for your jute, twine, buttons, and wonderfully decorated eggs!! Love it!